Metropolitan Utilities Corporation Sdn Bhd (MUC), the pioneer privatised company to embark on a quest in the water privatisation project in Malaysia by undertaking the water management of sourcing, treating and supply of treated water to end-users in Perak. Under this privatisation project and equipped with the right source of expertise and technology, the capital works for MUC involve the upgrading of water treatment plants, construction of concrete reservoirs and laying of trunk mains as well as pipelines. 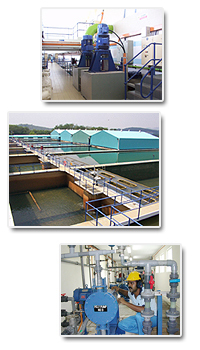 MUC is regarded as one of the best managed and most efficient of the regional water supply companies in Malaysia, and is committed to giving the highest standards of service to its customers by continuously exploring new technologies that will provide high quality of treated water. Turnkey construction for water works projects, ranging from water treatment plants, storage reservoirs and pipelaying works. More about Metropolitan Utilities Corporation Sdn. Bhd.